We have all come across exceptional bosses or mentors who encourage us to go the extra mile or who inspire us by bringing out the best in us. And most of us have also experienced bosses who are the exact opposite. They will put their interests first and are more interested in the world of Machiavelli then in bringing out the best of both teams. The same goes for friends or colleagues. There are some who will do whatever it takes to help you, sometimes even ignoring their interest, then there are those who just take without giving. 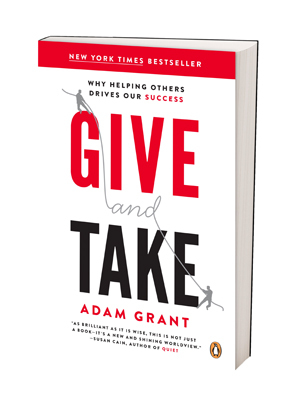 Adam Grant’s book, Give and Take – a revolutionary approach to success shows that you do not have to be ruthless to climb to the top. This book is on many lists as one of the best books on management and the art and science of success and after reading it there is no question as to why it is so. The book is simple in its premise. In life, most people are either givers or takers. Grant shows that while takers may sometimes win in the short-term, givers are not only at peace with themselves but have all that it takes to inspire people and do well in the long run. I have no doubt that this will become a classic book on leadership and management. Grant makes a great case and includes countless examples of givers who have made a success out of their approach that you start to look at people in a completely different light. This is a definitely a must read for anyone who wants to be successful in life. Grant shows with many examples to back his thesis that one of the secrets in life is that those who win most are often those who give most. It takes time for givers to build goodwill and trust, but eventually, they establish reparations and relationships that enhance their success. Being a giver is not good for a 100-yard day, but it is valuable in a marathon. If we create networks with the sole intention of getting something we won’t succeed. We can’t pursue the benefits of networks; the benefits ensue from investments in meaningful activities and relationships. Takers have a distinctive signature: they like to get more than they give. Advice seeking is a form of powerless communication that combines expressing vulnerability, asking questions and talking tentatively.